Eastman Business Park, formerly known as Kodak Park, is a 1200 acre industrial campus that provides a wide range of facilities and services for tenant companies. EBP currently has 27 tenants in areas including imaging, biofeuls, biochemistry, solar energy, and medical materials. There are currently 4 CEIS partner companies in the park and we anticipate that number will grow as the Park adds new tenants. Our primary financial support comes from NYSTAR, the Division of Science, Technology, and Innovation in the New York State Department of Economic Development. The mission of NYSTAR is to help new and existing businesses become more competitive through the use of innovative technologies. A key part of the strategy for doing this has been to strengthen the research and technology capabilities of our colleges and universities to help create the intellectual capacity which drives high tech growth. NYSTAR's programs emphasize the importance of working with industry to leverage our technology strengths to produce new products and, therein, new and expanded jobs in the state. CEIS is one of 15 Centers for Advanced Technology located at the leading research universities around the state. The purpose of the CATs is to support university-industry collaborative research and technology transfer in commercially relevant technologies. The FuzeHub team consists of experienced manufacturing and business professionals who are knowledgeable gateways to New York State’s vast technology, research, engineering, and equipment assets. FuzeHub responds directly to all company requests within 24-48 hours, as the first step to connecting you to specialized technical resources, programs, and services. Our manufacturing specialists work one-on-one with your company, engaging domain experts as needed to analyze your specific needs and opportunities. Whether you submit a request at www.fuzehub.com or meet with us at one of our Solutions Forums, FuzeHub’s engagement with your company is expedited, hands-on, and highly effective in connecting you to the best solution for your manufacturing and innovation needs. FuzeHub is a non-profit organization that serves as the statewide New York Manufacturing Extension Partnership (New York MEP) center, supported by Empire State Development’s Division of Science, Technology & Innovation. New York MEP is part of a national MEP network funded by the National Institute of Standards & Technology and dedicated to helping small and mid-sized manufacturers with competitiveness and innovation. 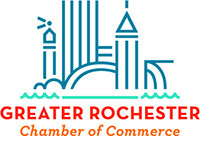 The Greater Rochester Chamber of Commerce is the chamber of commerce for the nine-county Rochester region, which includes Monroe, Genesee, Livingston, Ontario, Orleans, Seneca, Wayne, Wyoming and Yates counties. We provide information, advocacy, human resource services and networking to help employers grow. Greater Rochester Enterprise (GRE) is a regional economic development organization supported by a team of private and public sector leaders dedicated to improving economic performance in the Rochester/Finger Lakes, New York Region. Our primary goals are to retain and expand existing business and to professionally market this region as a competitive, vibrant and high-profile place for business location and growth. To support business attraction, expansion, entrepreneurship and innovation, GRE collaborates with local businesses, universities, not-for-profit organizations and government leaders to deliver a unified response to regional economic development opportunities. CEIS works with GRE by providing easy access to many different faculty at UR and RIT engaged in a wide range of research. Through our interaction with many companies and faculty, CEIS also occasionally identifies companies from outside the region that would be good candidates for relocating or expanding into the region. New York Photonics (NYP) is a not-for-profit organization founded to promote and enhance the New York State optics, photonics, and imaging industry by fostering the cooperation of business, academia and government. NYP membership includes over 50 companies that supply optics, photonics, or imaging products and services and over 40 support companies. NYP and CEIS work closely together with NYP providing in depth knowledge and strong ties to the industrial community and CEIS providing the same with the academic community. NextCorps (formerly known as High Tech Rochester) is a not-for-profit economic development organization and is an authorized center of the NIST funded Manufacturing Extension Partnership (MEP), a manufacturing assistance program. NextCorps Growth Services provides support in areas such as strategic planning, quality system development, sales and marketing, product development and productivity improvement to all types of manufacturers in the Finger Lakes Region. NextCorps also offers business incubation for high tech startups at two different locations, the Lennox Tech Enterprise Center in Henrietta and at Sibley Square in downtown Rochester. The Entrepreneurs Network (TEN) is one of Upstate New York's fastest growing initiatives designed to bolster new ventures (early stage technology; life sciences) AND established firms (scalable, high-revenue potential; family-owned; and/or ownership transitioning.) TEN members do better: winning government grants and contracts, increasing revenues by retooling sales & marketing strategy, and securing equity financing or traditional sources. CEIS cross-promotes events and many of our partner companies benefit from the training offered by TEN.